The banana is an edible fruit, botanically a berry, produced by several kinds of large herbaceous flowering plants in the genusMusa. In some countries, bananas used for cooking may be called plantains. The fruit is variable in size, color and firmness, but is usually elongated and curved, with soft flesh rich in starch covered with a rind which may be green, yellow, red, purple, or brown when ripe. The fruits grow in clusters hanging from the top of the plant. Almost all modern edible parthenocarpic (seedless) bananas come from two wild species – Musa acuminata and Musa balbisiana. The scientific names of most cultivated bananas are Musa acuminata, Musa balbisiana, and Musa paradisiaca for the hybrid Musa acuminata M. balbisiana, depending on their genomic constitution. The old scientific name Musa sapientum is no longer used. Musa species are native to tropical Indomalaya and Australia, and are likely to have been first domesticated in Papua New Guinea. 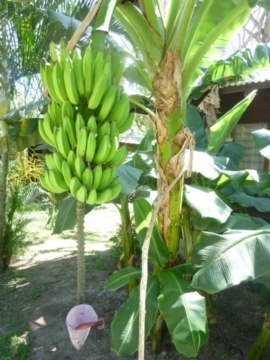 They are grown in at least 107 countries, primarily for their fruit, and to a lesser extent to make fiber, banana wine and banana beer and as ornamental plants. The classification of cultivated bananas has long been a problematic issue for taxonomists. Linnaeus originally placed bananas into two species based only on their uses as food: Musa sapientum for dessert bananas and Musa paradisiaca for plantains. Subsequently further species names were added. However, this approach proved inadequate to address the sheer number of cultivars existing in the primary center of diversity of the genus, Southeast Asia. Many of these cultivars were given names which proved to be synonyms.